© Eamon Kiernan. All rights reserved. Michael Cardinal Cremin. His Eminence, the Cardinal. Your Eminence, Eminence. The new cardinal was looking at himself in the mirror. No matter how he turned the title in his mouth, the words had resonance. And no matter how he pulled at his face and twisted it, what looked back out at him was most distinguished. He closed one eye and looked at the side of his face which was lit by the eye that was still open. Then he did the same with the other eye. It was intriguing. He was two persons in the one face. Like Oscar Wilde’s Dorian Gray. A great story. There was a thrill of decadence to it which had given him no end of titillation when he was younger. And it was quite perceptive of human nature. Wilde, of course, had simplified things. A clear distinction between good and evil. Hiding the true self away in a portrait in an attic. In reality, of course, good and evil were a matter of perspective, and the true self was plain to see in the face of everyone; plain, that is, to those with eyes to see. When he closed his left eye and looked upon himself, he saw what everybody saw, the Bishop of Limerick, in Ireland’s Mid-West, who held more sway in the Roman Catholic Church than that minor post would suggest. A strong, decisive man. A man not unattractive to women, as he was constantly being reminded. A man at the vanguard of his time. He had been through most, if not all, of what made the Church what it was. The experiments in freedom of the 1960s. The great flowering of the Second Vatican Council. The reaffirmation of Catholic discipline in the reign of Pope John Paul II. In the light that shone on him through the many short-lived dramas on the stage of history, people could see something of what they themselves might yet become. He was one of those perfect beings you find in the media. A face of the times. When he closed his right eye a different man emerged. The force, the ambition, remained; but they belonged to a man of shadow, a man who was no stranger to the extremities of human passion, but who dwelt beyond them in a mysterious quiet, in depths well hidden from prying eyes. A man known to no-one, unless he chose to be known, and well satisfied with that. This was a rare human face. In his experience, few had possessed it. Fewer still had retained it to the end. The faceless face. The face under the mask. He glanced round the little bathroom with its gold fittings. There was a self-warming seat on the toilet. There were current affairs magazines in a little recess in the wall. And that generous mirror. Flying had never been so comfortable. It was a private plane, of course. Lent to him by his friend, Leo Murphy. He took up one of the towels which had been warmed for him on an array of heating pipes. It was fine cloth, and they had even embroidered it with his crest. A very nice touch. He dried his hands and stepped out into the oval cabin with its designer furniture and soft wood veneers. He was the way he wanted to be: alone. Hardly anyone anywhere had been like him. Only Jean Nordheider, really. What would Jean think of his elevation to Cardinal, he wondered. Now was the time to make plans. To look for allies. The pope himself was not worth bothering about. An old, spent man propped up by medication. Cardinal Ratzinger was the obvious choice, but the smooth German seemed to have been sidelined recently. Perhaps he should try all the cardinals, one after the other. Only those eligible for the conclave, of course. Not that it was a pleasant prospect. He thought very little of his fellow princes of the Church. It was the stewardess. He looked up at her, surprised, his attention captured by her perfume. “Need anything? No, no,” he said, and wondered was he telling the truth. It was her eyes. They reminded him of something. In the end, it was Nordheider who contacted him. A letter with the coat of arms of the Catholic University of Louvain, brought by courier and waiting for him on his return. Forty years, and you have been on the increase, I on the decrease. Now, as you approach your zenith, I approach my nadir, but gladly. I am retiring from the University on May 15th, next. It is time philosophy was released from my unworthy clutches. There will be a small get together at the Department to see me off , and I would be pleased to welcome as my guest of honour my most eminent student, perhaps my only student. Will you come? May your Eminence be more than a mere title. His most eminent student. Perhaps his only student. Michael Cremin. Priest of himself. A young theology student returns to Dublin from Louvain, where he has broadened his mind in ways kept quiet from his superiors. With the Second Vatican Council under way, he is posted to Rome, where he finds himself at the centre of the reform of the Mass. Singled out for promotion, he becomes a controversial bishop and cardinal, with his sights set on more. Through the career of the ambitious Michael Cremin, The Vineyard of the Nietzschean Priest lifts the veil on the Roman Catholic Church and reveals the aftermath of Vatican II: a wasteland in which spirituality is reduced to frantic experimentation, cold technologies of the self and the lust for power. They call him Michael the Cruel, yet he is haunted by the memory of warm hazel eyes and the love they reveal: a presentiment of feminine mystery, all but lost. Cremin lives his life like a lamp running out of oil. When it is almost too late, a life-changing experience enables him to begin again. 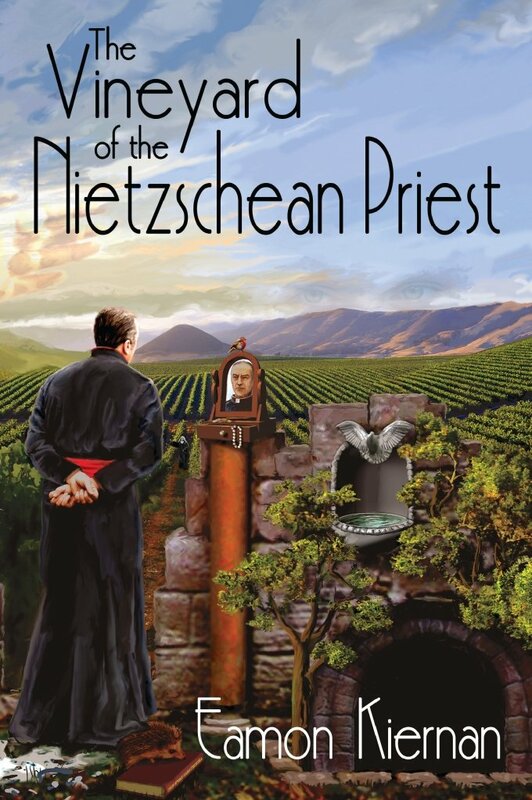 Blending fact and fiction, and drawing on authentic theological and historical sources, The Vineyard of the Nietzschean Priest relates unforgettable personal dramas of despair, awakening and repentance.